Alright, I’m way over denial with my car and bargaining. Now I’m just pissed. And frustrated. And irritated. As I mentioned yesterday, I had to have my car towed to my mechanic. It was missing like crazy and the check engine light was blinking. Now, unfortunately, the mechanic couldn’t deal with it and I sent it elsewhere. So I did that today and $400 later, I have it back, but I still can’t tell if it’s fixed. 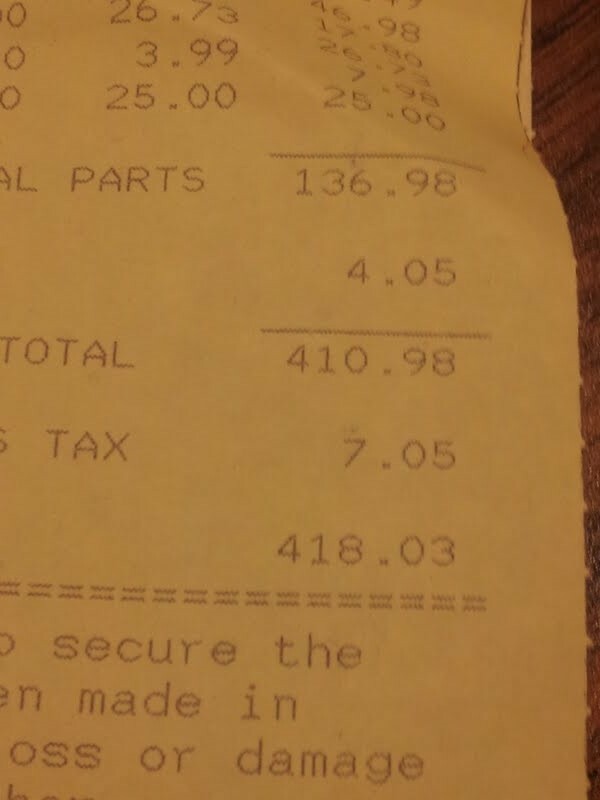 Plus, this mechanic also mentioned the axle issue which is really starting to freak me out. I don’t want to be driving down the road and have my axle break. I’ve googled it, and while it says my car will basically just stop moving, I’m not so sure. Plus, that’s only if I’m traveling in a straight line or if it’s a certain type of car. If I happen to be turning or if I’m really stupid and have the wrong car type, I could go flying off into the unknown somewhere. And, let’s not forget the underlying transmission issue. I like my car and I’ve had it a long time. We’ve been through college together and my first real job, among other things, but I think it may be time to let it go. I have no idea where to let it go to, but the idea of being able to fill up a windshield washer fluid reservoir, driving for 3,000 miles without having to carry quarts of oil in my trunk as back-up, moving smoothly down the road, not seeing a check engine light glowing and not having to google things like “what happens when an axle breaks” is beginning to sound really good. Car payment and all.